Our range of products include harbor n bay women printed sweatshirt, fashionable hooded sweatshirt for women and women's sweatshirt. This stylish Full Sleeve T-shirt from Harbor N Bay is a must-have for fashionable women. This T-shirt is surely not to be missed out on. An excellent pick for daily casual wear and weekend outings. 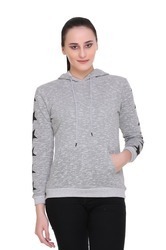 Head out in style wearing this Grey coloured sweatshirt from the house of HARBOR N BAY. Made of high-quality Cotton Blended fabric,This Light Weight sweatshirt will keep you quite comfortable throughout the day. Designed to perfection,this it can be best teamed with joggers and shoes. 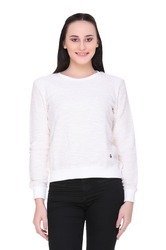 This stylish Full Sleeve Sweatshirt from Harbor N Bay is a must-have for fashionable women. This T-shirt is surely not to be missed out on. An excellent pick for daily casual wear and weekend outings.